"Bits of cooked bacon and mozzarella cheese are just two of the ingredients that make this easy spinach dip taste anything but ordinary." In a medium saucepan over medium heat, cook and stir the spinach, salsa, cream cheese and green onions until the cream cheese has melted. Mix in the crumbled bacon and tomatoes. Remove from heat. Mix in the mozzarella cheese, cumin, salt, pepper and garlic powder. This recipe is absolutely TO DIE FOR!!! YUMMY!!! Best served with blue corn tortilla chips that are a little on the salty side! I made this just as the recipe says, but did noot really care for it. The salsa gave it an unpleasant taste to me, a few people did like it. I loved this dip and so did my guests! It was very easy and the addition of the cumin gave it sort of an exotic taste. We had it with crackers and pita triangles, very tasty! 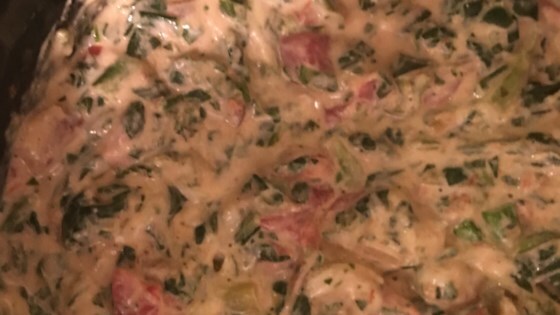 I brought this dip to a baby shower, and several people asked for the recipe. The biggest compliment to this dip is that my husband, who hates spinach, likes this dip. Made this for my Bunko group and the ladies loved it. Thanks! So easy. Absolutely delicious! My family's on a bit of a health kick, so I used light cream cheese and omitted the bacon. Still tasted fabulous! They all asked for the recipe. The best Spinach dip you will ever make...people came up to me to ask for the recipes. So delicious!